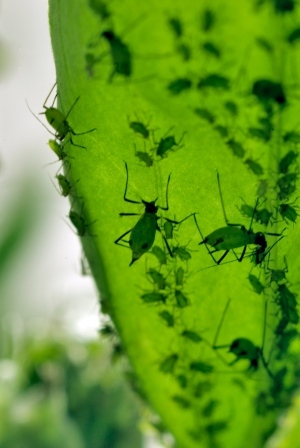 Aphids may have a rudimentary sunlight-harvesting system. Aphids are unique among insects in their ability to synthesize pigments called carotenoids. Many creatures rely on these pigments for a variety of functions, such as maintaining a healthy immune system and making certain vitamins, but all other animals must obtain them through their diet. Entomologist Alain Robichon at the Sophia Agrobiotech Institute in Sophia Antipolis, France, and his colleagues suggest that, in aphids, these pigments can absorb energy from the Sun and transfer it to the cellular machinery involved in energy production. Although unprecedented in animals, this capability is common in other kingdoms. Plants and algae, as well as certain fungi and bacteria, also synthesize carotenoids, and in all of these organisms the pigments form part of the photosynthetic machinery. Taking their cue from the 2010 finding2 that the high levels of carotenoids found in aphids are homegrown, Robichon and his team set out to investigate why the insects make such metabolically expensive chemicals. Carotenoids are responsible for aphid pigmentation, and an aphid's colour determines the kind of predators that can see it. The body colour of Robichon's lab aphids is affected by environmental conditions, with the cold favouring green aphids, optimal conditions resulting in orange ones and white ones appearing when the population is large and faced with limited resources. When the researchers measured the aphids’ levels of ATP — the ‘currency’ of energy transfer in all living things — the results were striking. Green aphids, which contain high levels of carotenoids, make significantly more ATP than do white ones, which are almost devoid of these pigments. Moreover, ATP production rose when the orange insects — which contain an intermediate amount of carotenoids — were placed in the light, and fell when they were moved into the dark. One of the authors, Maria Capovilla, another entomologist at the Sophia Institute, insists that much more work is needed before scientists can be sure that aphids truly photosynthesize, but the findings certainly throw up that possibility. The way that carotene molecules are arranged in the animals adds weight to that hypothesis. The pigments form a layer between 0–40 micrometres deep under the insect's cuticle, putting them in the perfect position to capture the Sun's light. Nancy Moran, an insect geneticist at Yale University in West Haven, Connecticut, who was responsible for the original discovery that aphids have the genes for carotenoid production, points out that there are many unanswered questions. “Energy production seems to be the least of an aphid's problems — their diet is loaded with excessive sugar, most of which they cannot use,” she says. And that begs the question of why aphids would need to photosynthesize. But Capovilla speculates that a battery-like back-up might help them in times of environmental stress, such as when they are migrating to a new host plant.